A new report from researchers at the University of Washington Bothell found that 8 in 10 charter schools statewide enroll a higher share of students with disabilities than the state average and their neighboring, traditional school districts. Do charter schools in Washington actually serve any students with disabilities? A new report from researchers at the University of Washington Bothell attempts to satisfy critics who doubt that the state’s nascent charter schools serve their fair share of students who might need more supports to learn. Since 2014, the number of charters — which are publicly funded but can be privately run — has grown to 10 this past year. They collectively enroll about 2,400 students. Two more schools will open this fall. But as their enrollment continues to grow, who’s actually attending charter schools in Washington? And are they serving students who require special, and sometime costly, services to accommodate their disabilities as required under federal law? We spoke to a researcher with the Center on Reinventing Public Education (CRPE), which earlier this month released its report addressing these questions, and two charter school experts to add some context about CRPE’s findings. Based on student demographic data as of May 2018, the authors found that 8 out of 10 charter schools currently operating in Washington enroll a larger share of students with disabilities than the state average of 12.4 percent. They also found that 8 of 10 charters enroll larger shares of students than the traditional public school districts where each one operates. Nearly 1 in 4 students at Green Dot Destiny in Tacoma received special education services, compared to 14 percent in the surrounding Tacoma Public Schools, according to the brief. The higher-than-average rates didn’t surprise Lauren Morando Rihm, executive director and co-founder of the New York City-based National Center for Special Education in Charter Schools, which receives funding from charter school supporters. Morando Rihm reviewed the CRPE brief before its publication. She noted that the Washington State Charter Schools Association, which oversees the development and launch of new charters, directs school founders to plan for delivering special education services well before they start enrolling students. “If I could wave a magic wand, all states would do that,” Morando Rihm said. “Washington was very intentional about special education. 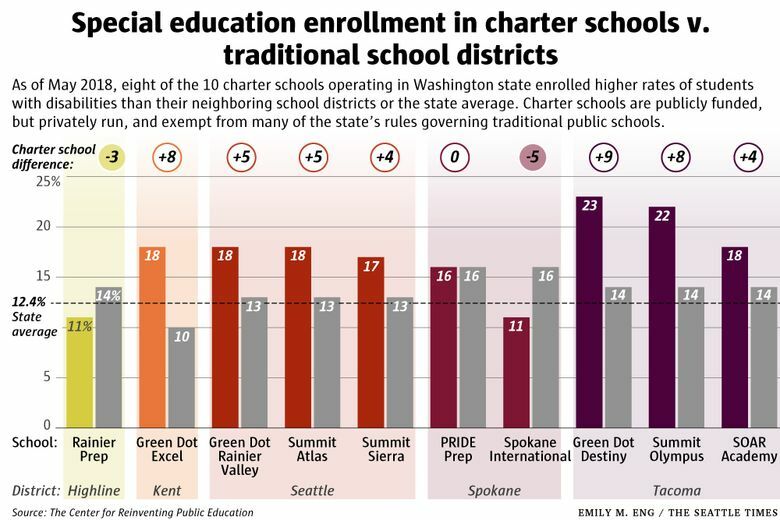 The only charters that enroll smaller shares of students with disabilities than their home districts were Highline’s Rainier Prep and Spokane International. As in many states, charters in Washington receive less state funding for each student they enroll than traditional schools collect. And that requires charters to stretch fewer dollars to cover the costs of providing special education services for more students. “This is a problem in the charter sector nationally,” said Sivan Tuchman, a research analyst with CRPE and lead author of the brief. Ron Zimmer, a professor at the University of Kentucky, directs the Martin School of Public Policy and Administration and has studied charter schools across the U.S. He suggested the CRPE brief might not convince critics of charter schools to change their minds, mostly because the authors did not compare similar types of schools. “You’re taking the whole (traditional) district and then the charter schools in them, but charter schools are not randomly distributed across the district,” Zimmer said. He doubted the validity of comparing one charter school, located in and enrolling students from a high-poverty neighborhood, to a more affluent district like Seattle. The brief also didn’t compare the same grade levels between charters and their home districts. The brief also used enrollment data to claim there was no evidence that Washington charters convinced families with students with disabilities to pull their children out of the school or never enroll in the first place. But Zimmer cautioned that the authors failed to track individual students who entered and later left a charter school. “These additional steps would probably help convince some skeptics,” Zimmer said. The study also does not account for the severity of the needs of students served in each type of school. The overall demographics don’t tell the full story. Tuchman acknowledged that student-level data would help clarify which students are leaving charters in Washington — and also who’s staying and where they’re coming from. Starting this fall, CRPE will start five case studies to explore those questions and, according to Tuchman, get a better sense of what’s happening in charter schools and why families choose to move their students with disabilities out of a traditional district.